Because of the need to use the Bernoulli Effect to move the boat along, the sailor’s job is to keep the sail in an efficient relationship to the wind. As the sailor steers in one direction or another, what changes is the angle of the boat to the wind, not the angle of the sail to the wind. This is easiest to understand through pictures. In this diagram, the wind is coming from the top of the screen—or from the north. Notice how the sail stays at the same angle to the wind while the boat changes its angle to the wind. Each boat angle has a name. These names indicate the “points of sail.” Thus, when a sailor is sailing “close-hauled,” the boat is sailing about 45 degrees off the direction of the wind. 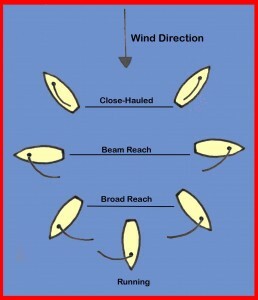 When he is on a “beam reach,” the boat is sailing at about 90 degrees to the wind.